It’s December and that means the holidays are around the corner. This weekend, Knightdale has a lot of Holiday theme events going on. On Friday, Knightdale Station Park Amphitheater will have the Christmas Tree lighting. The festivities start at 6 pm. Be sure to check out food trucks Baguetteaboutit, Cousins Maine Lobster, Hibachi Xpress, and CJ Funnel Cakes. On Saturday, the Knightdale Christmas Parade will travel through the town. Tacos Las Gringas will be in the parade promoting RDUMFA’s food truck rodeo on Sunday (more details below). King’s Authentic Phillycheeseateaks and CJ Funnel Cakes will serve parade watchers. All above events are organized by the Town of Knightdale and details can be found on their website. 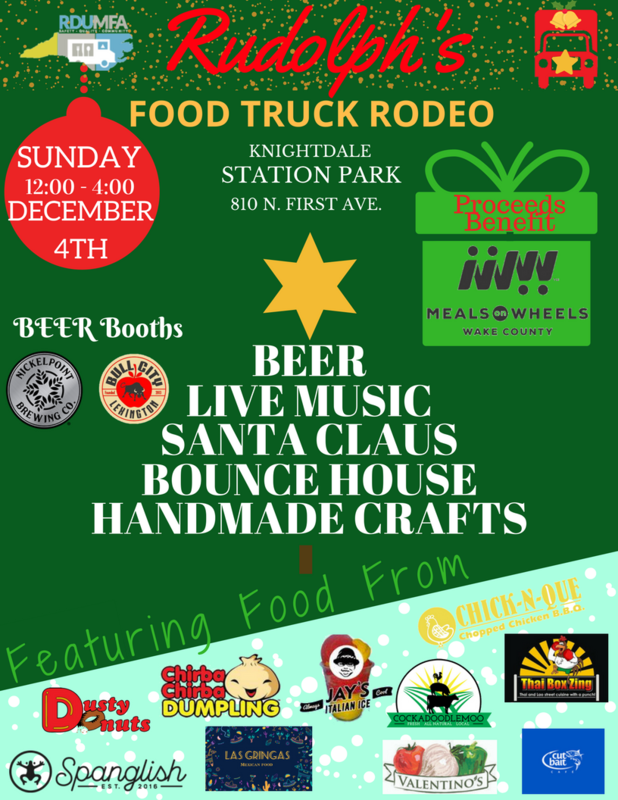 On Sunday, RDUMFA, the Triangle’s mobile food association, will hold its 2nd Annual Rudolph’s Holiday Rodeo Sponsored by Choice FM 92.1 FM and Craft Financial LLC. The event will have over 10 mobile food vendors from various cuisines, desserts, and even treats for pets. The event will also have live music performances, a visit from Santa, a gift wrapping section, and bouncy houses and pinatas for the children. Proceeds from the event go to Meals on Wheels of Wake County. For information on Rudolph’s Holiday Rodeo, check out RDUMFA’s website.